I am so excited to share this room with you all, I have spent a deal of time decorating and redecorating, finally having it the way I envisioned. Having completed another room in our home feels great, come in and take a peek. In case you missed Our Christmas Kitchen Home Tour, you may have noticed I have a thing for flocked trees. I’m a little obsessed. We have one in the kitchen and now a couple more in the sunroom. I adore white for Christmas and having white trees gives me a tingling feeling. Am I the only one? I knew I wanted 2 trees in the sunroom this year but was undecided about the decor. Until I came upon this garland from Mackenzie-Childs HERE, and at 70% off it was a no brainer. I purchased some black velvet ribbon in the signature gingham style, also from Mackenzie-Childs, to use in making a bow and to use in decorating the tree. You can read more about How to Make a Simple Holiday Bow with a Tail. The black velvet “ties” the decor all together and makes the mantle a statement piece. You may recognize the coffee table from our family room. I am constantly moving furniture around to see what works and what doesn’t. I wanted to bring more black into the room to tie in with the ribbon and the fireplace surround, and this coffee table works perfectly. Adding a few natural elements of gold and white to the table gives the room a lived in feel. The sofa was relocated to make room for the second tree and now faces the fireplace. I love sitting directly in front of the fireplace now. I am big on symmetry and this room just feels right. The white flocked trees are 9 ft and are the perfect size for the space. Did you read 3 Tips to Setting up a Christmas Tree Like a Pro, you will find helpful tools to assemble your tree. In an upcoming post, I will discuss the ribbon method I used for these trees, it’s so simple. I decided not to add additional decor on the fireplace mantle, the garland is the perfect accent. I love the way the top of the fireplace looks since I painted the granite slab white, originally I painted it silver, check out Is It Possible to Paint a Granite Surface? The tree is decorated with white, gold, and silver ornaments, accented with gold pointsettia and off white magnolia stems. This is elegant and warm and cozy. The combination of colours is exceptional and difficult to do-the tones have be just right for the gold and silver to be used together. Although the mantle wreath is a statement in itself I think the mantle would benefit from some adornment. Three white pillar candles on one corner perhaps? Enjoy your post so much. Very inspiring. Hi Karen, thank you for commenting. I will take your suggestion and give it a try, glad you liked the post! Amazingly beautiful! 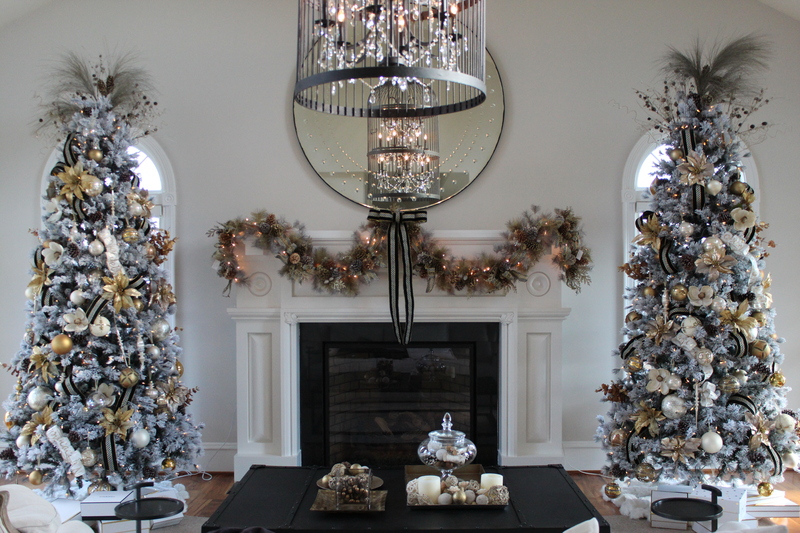 I like the way the full garland, large mirror with bow and the trees coordinate perfectly. Nothing else is needed. Can you share the color and brand of paint you used to paint the walls? Thank you for sharing the name of the paint color. We plan to paint our entire home after the holidays so I will take a look at this paint. How exciting Sandra, I’m happy to help! If you go on the RH website and search for paint, you can see the other coordinating colors in the ASH family, I have all of them in my house. Love the “Right White” looks beautiful with ASH.